7 Kids and Us: Felix Lingonberry Jams from Sweden! In our family, the best day is when someone says "let's go to IKEA!" we are all excited, not for the shopping, but for the LINGONBERRY! We don't have much for Lingonberries in America, so getting our fix at IKEA is always awesome. Recently, we were sent some Felix Lingonberry Jams in different flavors to try, and Riley and Xander both claimed their jars and went to make some toast. 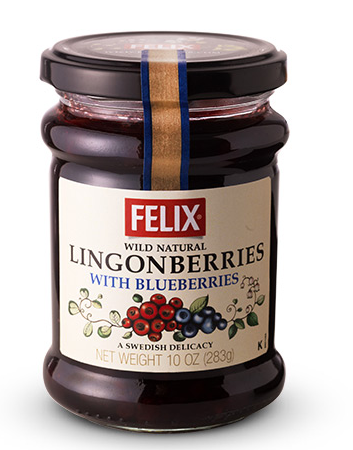 My absolute favorite is the Lingonberries with Blueberries! It has such a great flavor, and the blueberries make it even better, plus...health benefits of blueberries! Imagine that you are about to go out into the woods to pick berries. Now imagine that the woods are about the size of Michigan. Welcome to Sweden! Trees cover 95,553 square miles, or 55% of the surface area of Sweden. Where there are woods – you can find berries, and in Sweden, anyone is allowed to pick them. It is fairly easy if you know where to look, but you have to have the energy to hike in the woods, pick the low growing berries while bent over, and then carry your heavy harvest back home. You cannot be scared of wild animals either, as bears are particularly fond of the blueberries that grow in the same environment! 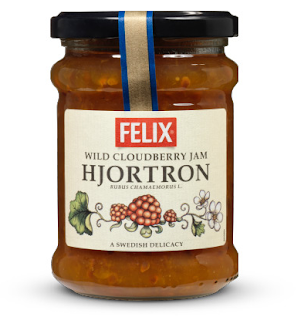 Since many Swedes are accustomed to picking their own wild berries, an extra high standard is required for jams to succeed in Sweden. At FELIX®, we select our raw materials with great care. With our focus on great taste and sustainability, we create products that are made of high-quality ingredients. Maybe this is the reason our lingonberry jam is number one in the US. Felix also makes other jams, that I would love to try! Like this one, Cloudberry Jam..I don't know what a Cloudberry is, but can it not be delicious? You can purchase Felix Jams online here.